September 20, 2017 — Links International Journal of Socialist Renewal — In 1713-14, it took the troops of Spain’s Borbon monarchy 14 months of siege before taking Barcelona and ending Catalan self-rule. In September 2017, Catalonia is again under siege, this time from the central Spanish People’s Party (PP) government. Under prime minister Mariano Rajoy the Spanish state is concentrating all its firepower on stopping the Catalan government’s October 1 independence referendum. On that day, if this siege is successfully resisted, Catalan citizens will vote on whether “Catalonia should become an independent state in the form of a republic”. Since September 6, the day its parliament adopted its referendum law, Catalonia has experienced a “shock and awe” offensive aimed at forcing the pro-independence government of premier Carles Puigdemont to submit to the central Spanish administration. 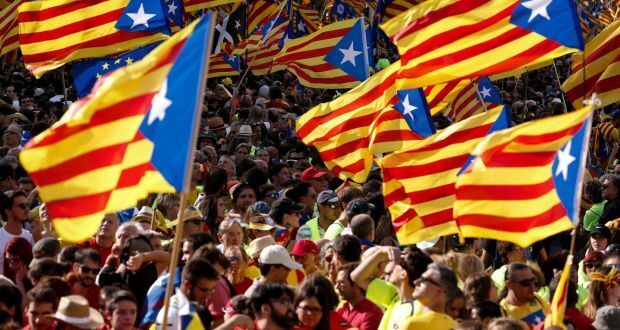 The adoption of the law by the parliamentary majority of 62 Together For The Yes (JxSí) and 10 People’s Unity List (CUP) MPs was the culmination of an eight-year process that has seen over one million people mobilise every Catalan National Day since 2012. May 7, 2017 –– Links International Journal of Socialist Renewal –– The struggle to build a Catalan political force inspiring the level of support and activism needed to implement radical social change took a step forward in Barcelona on April 8, when the new “political subject” provisionally called Un País en Comú (“A Country Together”) held its founding congress. Un País en Comú, whose final name will be decided by membership referendum, is the third Catalan progressive unity project with en comú (“together” or “in common”) in its title. 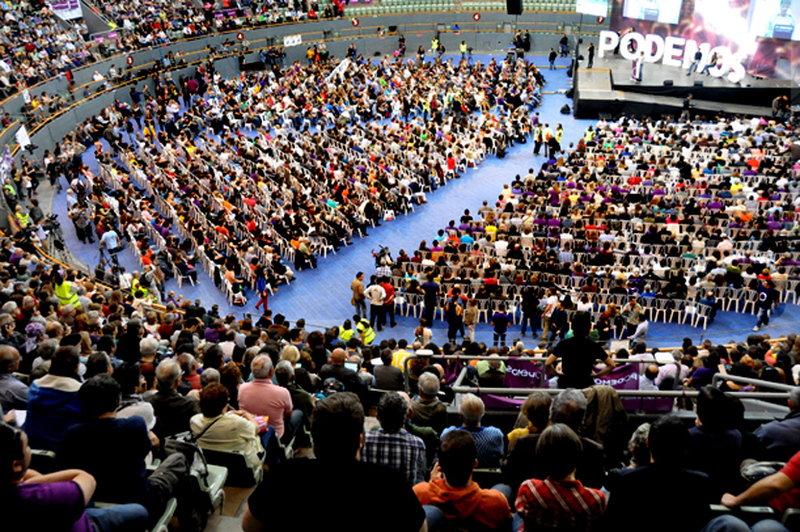 The first, in June 2014, was the broad activist coalition that under the name of Barcelona En Comú won the May 2015 Barcelona city council election. In defeating the ruling conservative nationalist Convergence and Union (CiU) the new formation made former housing rights activist Ada Colau the city’s mayoress and a reference point for radical politics across the Spanish state. 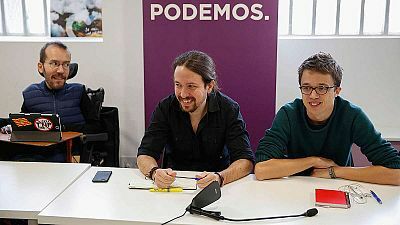 The United We Can campaign is generating enormous enthusiasm and by far the biggest rally crowds of any of the parties in the lead up to the June 26 general elections in the Spanish state. June 21, 2016 — Links International Journal of Socialist Renewal a much shorter version of this article was published in Green Left Weekly — The Spanish and European establishments have, at the time of writing, less than a week to lock the door against the advance of the progressive alliance United We Can (Unidos Podemos) in the June 26 general elections in the Spanish state. How are they doing? As matters stand, not very well. The Socialist Alliance recognises and welcomes the June 30-July 3, 2013 popular mobilisations of the Egyptian people, led by youth, for democracy, human rights and social and economic justice that brought down the regime of President Mohamed Morsi and the Muslim Brotherhood. The Socialist Alliance notes that the number of Egyptians who participated in the protests was higher than the number who voted for Morsi, as was the number of Egyptians who signed the Tamarod petition calling for the president to step down. At the same time, the Socialist Alliance condemns the violent and repressive measures of the Egyptian Armed Forces since July 3 in particular the July 8 massacre of more than 50 unarmed supporters of the Morsi government and the arbitrary detention of Morsi and other leaders and functionaries of the deposed regime. The 1.68 million-strong vote for United Left was not just the result of the general disaffection with the major parties, but also of a decision to connect its campaign with the protest movement. November 29, 2011 – Links International Journal of Socialist Renewal/Green Left Weekly -- On election night, November 20, it all went as the polls had forecast: the Spanish Socialist Workers Party (PSOE) government was massacred, with its lowest vote in 34 years; the right-wing Popular Party got an absolute majority; and left and left-nationalist forces emerged stronger, led by the United Left (IU) and Amaiur, the Basque left-nationalist coalition (results here). Mobilisation of the ENOUGH campaign against the IMF in Dublin on July 16, 2011. One of the European actions the European Anti-Capitalist Left pledged to build. The following statement was adopted by the anti-capitalist left organisations meeting together in London on June 11-12, 2011, on the call of the SWP (Britain) and the NPA (France) as a follow-up to the previous conferences held in Paris in June 2008 , December 2009 , and May  and December  2010. Text from International Viewpoint. Demonstrators in Madrid's famous Puerta del Sol protest against politicians, bankers and authorities' handling of the economic crisis on May 19, 2011. Photo by Pedro Armestre/AFP/Getty Images, via The Atlantic, which has more graphic photos. May 29, 2011 -- Green Left Weekly -- The central plazas of dozens of cities and towns across Spain bear an uncanny resemblance to Tahrir Square in Cairo. They have been taken over by thousands of demonstrators demanding a "new system". As of May 29, dozens of other central plazas in Spanish cities and towns look the same — taken over by thousands of ordinary people demanding “a new system”. “There are many Joses here, I’m not sure if its my turn or another Jose”, said Jose, a middle-aged man standing on the outer rim of a grupo de trabajo (work group) called at midnight on an adjacent street to Sol, the plaza known as point zero, in the heart of Madrid. The plaza has been occupied, as have dozens around Spain, since the huge protests on May 15 that brought hundreds of thousands of people onto the streets to demand “real democracy now!” and an end to austerity measures... That the protesters are mostly young is no surprise in a country where youth unemployment is about 40% and university graduates consider themselves lucky to secure a job at a fast food outlet. The overwhelming sentiment is that corrupt politicians must be banned from re-election and the electoral laws must be reformed so that they are more representative.